Aghasi Khanjian (Armenian: Աղասի Խանջյան; Russian: Агаси Гевондович Ханджян, Agasi Gevondovich Khandzhyan) (January 30, 1901 – July 6, 1936) was First Secretary of the Communist Party of Armenia from May 1930 to July 1936. Khanjian was born in the city of Van, Ottoman Empire (today eastern Turkey). With the onslaught of the Armenian Genocide, his family emigrated from the city in 1915 and settled in Russian Armenia. In 1917-19, he was one of the organizers of Spartak, the Marxist student's union of Armenia. He later served as the secretary of the Armenian Bolshevik underground committee. 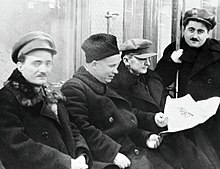 But by the mid-1930s Khanjian had come into conflict with the most powerful party leader in Transcaucasia, Lavrenti Beria, a Georgian close to Stalin. Early in July 1936 Khanjian was called to Tiflis. Suddenly and unexpectedly it was announced that the Armenian party chief had committed suicide. Though the circumstances of his death are murky, it is believed that Beria had ordered Khanjian's death to remove a threat to his own monopoly of power. According to Robert Conquest, Khanjian was shot by Beria when he visited the latter's office. Along with an entire generation of intellectual Armenian communist leaders (such as Vagarshak Ter-Vaganyan), Khanjian was denounced as an enemy of the people during the Great Purge. Khanjian was officially rehabilitated after the death of Joseph Stalin. Aghasi Khanjian's commemorative plaque in Yerevan. ^ a b c d Zev Katz, Rosemarie Rogers, Frederic Harned. Handbook of Major Soviet Nationalities. New York: Free Press, 1975, pp. 146-47. ^ a b Suny 1993, p. 156. ^ Ronald Grigor Suny, "Soviet Armenia," The Armenian People From Ancient to Modern Times, Volume II: Foreign Dominion to Statehood: The Fifteenth Century to the Twentieth Century, ed. Richard G. Hovannisian. New York: St Martin's Press, 1997, p. 362. ^ Robert Conquest, The Great Terror: A Reassessment. Oxford: Oxford University Press, 2008, p. 225. Suny, Ronald Grigor (1993). Looking Toward Ararat: Armenia in Modern History. Indiana University Press. ISBN 978-0253207739.